Listen, the news is tough, and we all need moments of escape from the horror to recuperate and prepare for the next onslaught, and I can talk about shoes all the livelong day, so welcome to the OMG SHOEZ thread. Got a favorite pair of shoes you want to share? Bought a new pair about which you're super excited? Have a recommendation to make, or want to caution us away from a purchase you regret? Want to solicit suggestions for a specific event, a foot issue, an elusive something for which you've been hunting? Having trouble finding something particular on a budget? Have at it in comments! Söfft's Veronica, in Winter Blue. I have owned these shoes for almost a decade, and they still look and feel amazing. In the original post about them, I wrote that I'd "been grocery shopping in these things, and suffice it to say that is not something I can normally do (or want to do!) in heels." When I took this picture the other day, I was at a Walgreens — which was one of a few stops that day. Still able to do a lot of walking around in them after all these years. 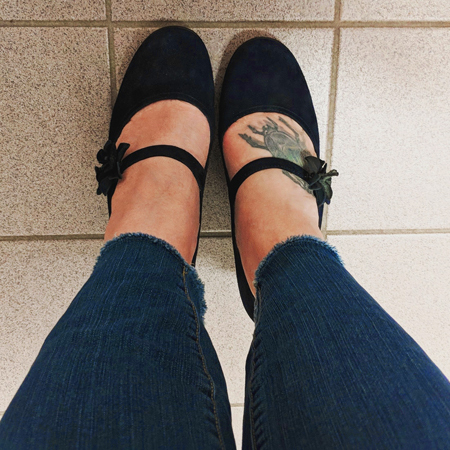 I've owned both heels and flats by Söfft, and every pair has been super comfortable and lasted me a very long time. They're definitely one of my favorite brands! So, that's what up with me! What's up with you?